Help provide needed items to our families by organizing and helping run our small onsite household pantry! Amethyst Place is a transitional housing program for women in recovery from drug/alcohol addiction and their children - if not for this place, many of these women and children would be in shelters and/or foster care. 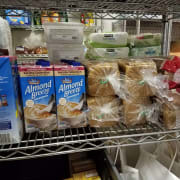 While many of our residents are working towards full time care of their children, they may not qualify for SNAP (food stamps) or other support systems so we have an on site pantry that supplies our residents and alumni with food items (partnering with Harvesters food bank), hygiene & household cleaning items (partnering with Giving the Basics) and diapers (partnering with Happy Bottoms). Pantry assistants will be responsible for opening the pantry for 2 hour shifts, and while on duty will organize and stock items so that residents can shop for what they want and need easily. Assistants will work with our staff to keep track of inventory and requested items to stock in the future. This is a great opportunity to interact with our residents in a short term, focused way. Shifts of two hours will be weekdays (Mondays 3-5 pm, Tuesdays 9-11 am, Fridays 4-6 pm). Reply to this ad to get in touch with Mandy, our volunteer coordinator, and learn more!